DIRECT LIFT® is registered trademark of ROTARY LIFT® Corporation. Here at BendPak, we believe that one of the primary forces pushing our industry forward is friendly competition. And if you're already familiar with A Study in lift Design, you know that we like to cut through the marketing fluff and conduct straightforward comparative analyses. This strategy provides both us and the consumer with definitive proof that BendPak lifts are as robust and feature-rich as possible. At the same time, it's enlightening to review the stark differences in design, materials and manufacturing that can exist between two seemingly identical products. No doubt you've noticed that our test subjects have differing lifting capacities. The reason for this is simple: BendPak currently does not offer an 8,000-lb. 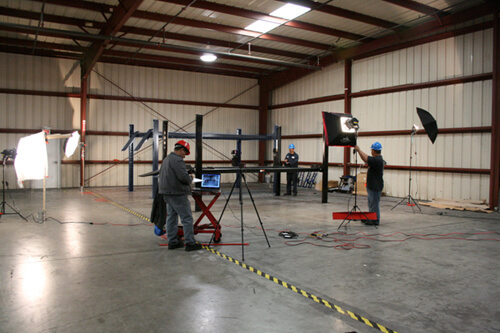 max capacity four-post lifting solution. 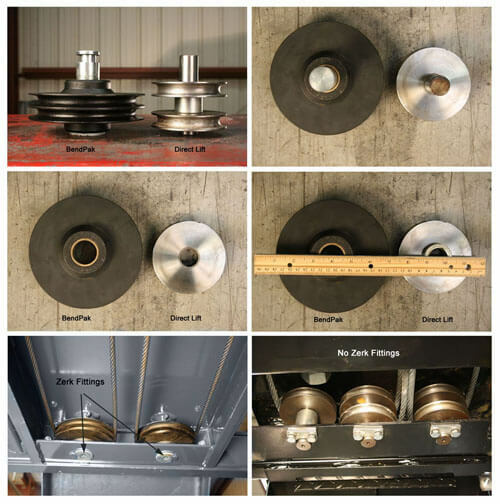 Therefore, this test is not at all concerned with weight capacity—we fully believe that each ​lift is capable of supporting the reported amount. Instead, we've focused our lens on build quality and engineering to let you draw your own conclusions about how those significant factors affect performance and long-term value. 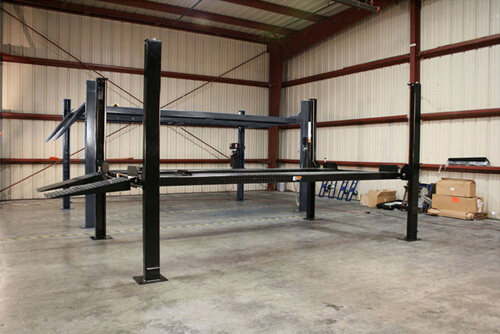 Nonetheless, both car lifts are considered to be in the same weight class and, despite a 1,000-lb. capacity difference, sell within less than $500 of each other. Instead of overwhelming you with our own verbiage, the following comparison mostly presents the reader with a set of illustrative photos, our nine against their eight, side by side, top to bottom. What you do with this renewed perspective is your own decision. However, if you would like some more information on our findings, please read the summary posted at the end. If you have a hard time seeing the photos below, clearer images are shown here. The HD-9 is ready for its closeup! BendPak vs. Direct Lift... who will prevail? 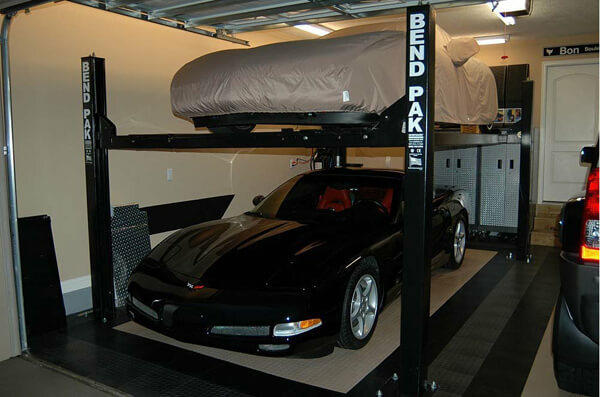 BendPak four-post lift fits perfectly in an average-sized garage. 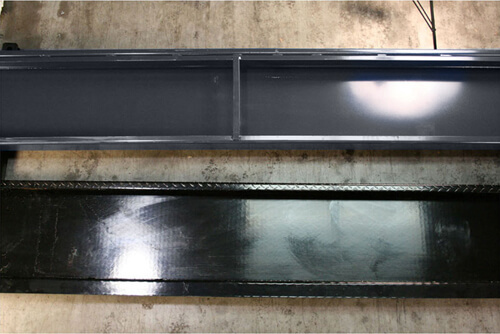 Exposed: Direct Lift's externally routed components. BendPak's better construction is visible to the naked eye. Direct Lift's ladder design is separate from the column. BendPak uses a corrugated hose protector to keep hoses from getting caught on moving parts and to hide unsightly plumbing. 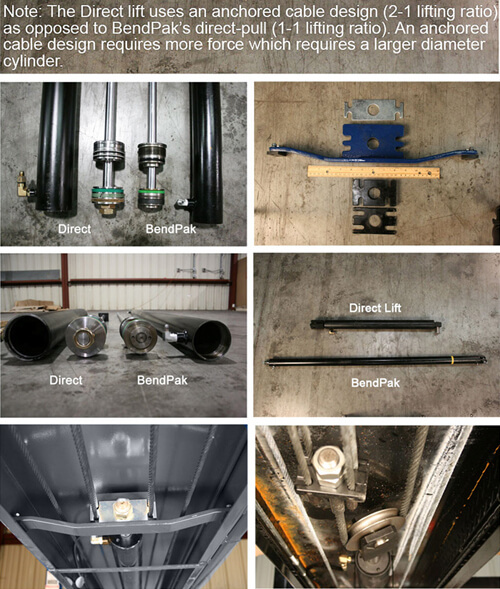 Compare BendPak and Direct Lift cylinder connections. BendPak's textured surface prevents slippage, even in wet conditions. Oversized sheaves for your protection, only with BendPak. 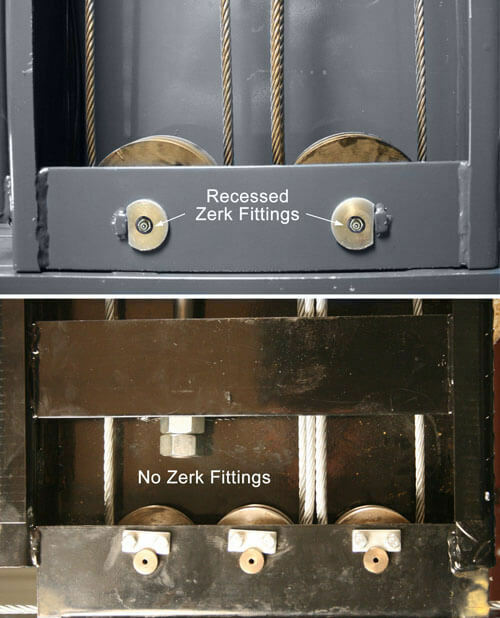 Recessed Zerk fittings protect your investment for years of steady use. Compare carriage designs: BendPak offers more. 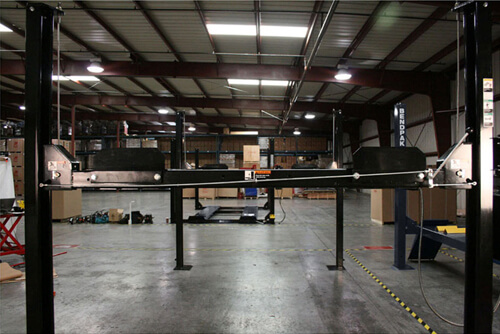 The Direct Lift uses an anchored cable design (2:1 lifting ratio) as opposed to BendPak's direct-pull (1:1 lifting ratio). An anchored cable design requires more force, which requires a larger diameter cylinder. 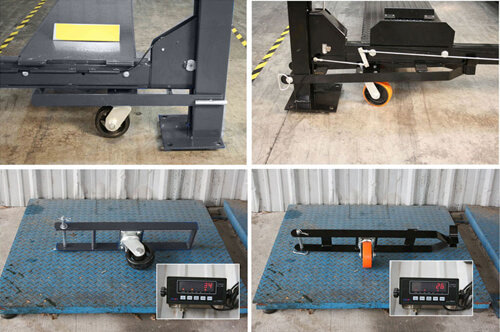 BendPak uses heavier-duty casters for your protection and convenience. Most BendPak components are considerably heavier than their Direct Lift ProPark-8 counterparts. 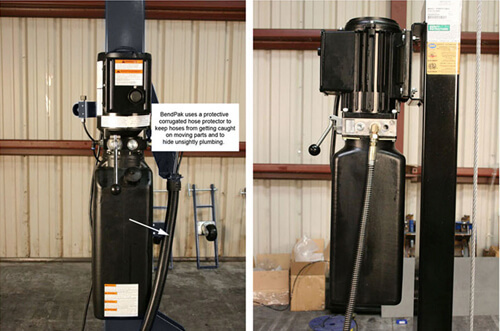 The Direct Lift ProPark-8 Plus utilizes a "pulley" system (2 to 1 lifting) as opposed to a direct-pull setup offered by BendPak's HD-9 Series models (1-to-1 lifting). 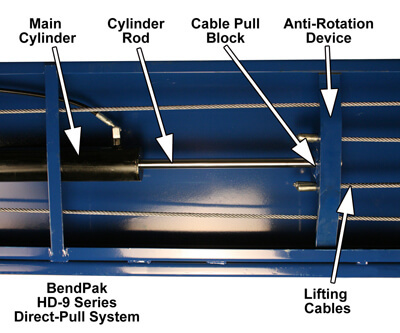 BendPak's direct-pull design (shown below) allows the four independent cables to be attached directly to the cylinder pull-block. 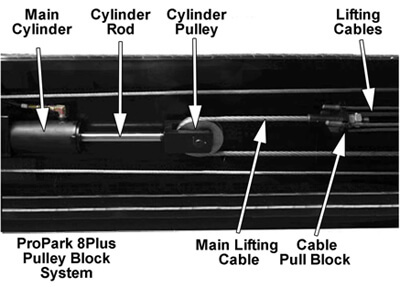 The four lifting cables on the Direct Lift pulley design (shown below) are attached to a single lone lifting cable that is tethered from the end of a cylinder pulley. The single cable carries the entire load during raising or lowering operations. The ProPark-8 Plus pulley system requires a larger diameter cylinder and higher working pressure because it takes twice as much hydraulic force as a direct pull setup (BendPak). 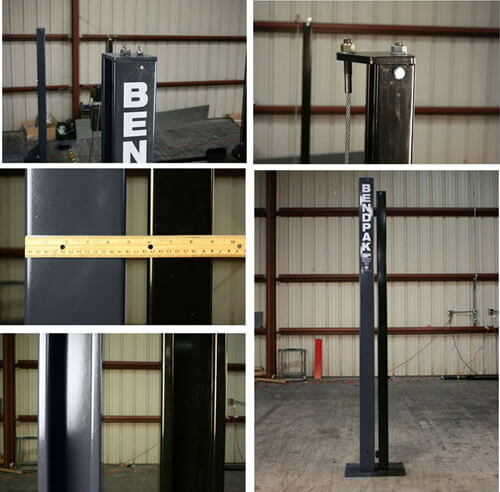 BendPak's cable-block features anti-rotation outriggers that minimize rotation caused by cylinder movement and helps maintain perfect alignment of the lifting cables. BendPak cable sheaves are much larger diameter, meaning your lifting cables will have a much longer life expectancy with less chance of fatigue or failure. BendPak approach ramps have rollers on the bottom, so your floors don't get scraped up every time the lift is lowered. BendPak cable sheaves are wider and have over 300% the bearing (bronze bushing) surface for prolonged service life. The BendPak lift has real skid-grit on the runways as opposed to diamond plate. Although diamond plate has a unique appearance, it does little for skid assurance when the runways are wet or oily. The BendPak lift has more locking positions. The Direct Lift ProPark-8 lifts have external mounted cross tube sheaves that are side loaded relative to the centerline of the cross tube. External mounted cross tube sheaves tend to put more strain and bending moment on the sheave axles. The sheaves are held in place by a single external shaft collar. 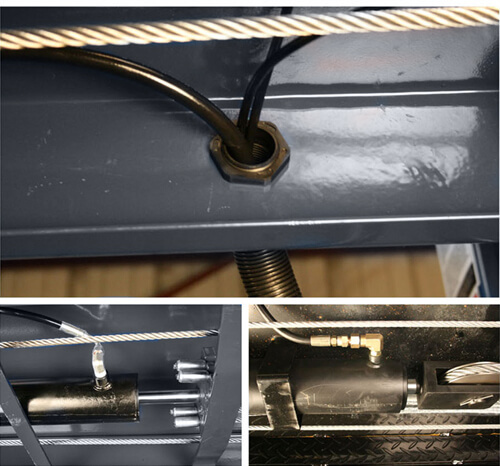 The Direct Lift ProPark-8 cables are not neatly routed within the structure of the lift. 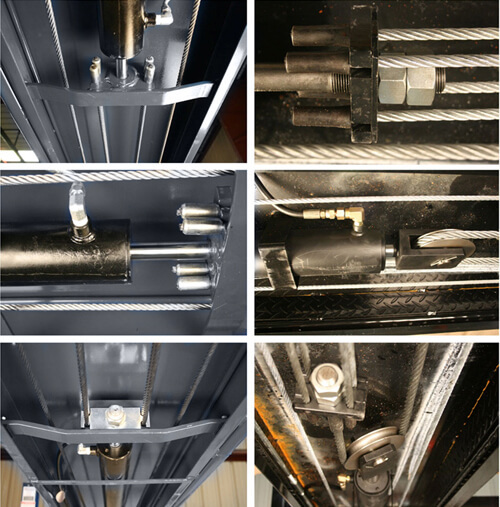 BendPak lifts are equipped with a single push-button pneumatic lock system. Direct Lifts have clumsy, multi-rod, multi-adjustment, manually operated locks featuring a handle you need to hold down during the full decent. Remember, the lift is moving as you are holding the handle down to the floor. 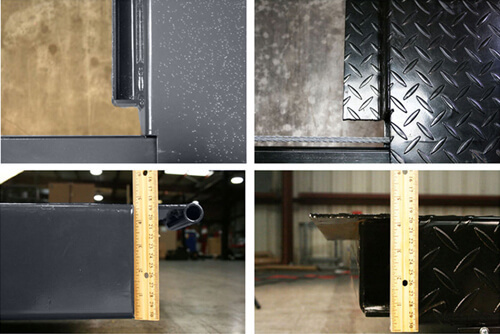 BendPak runways feature a separate welded on rail assembly (for the jacks and trays) that acts as a stiffener, making it less likely that the runways will sag when loaded. (Not pictured) BendPak includes 12 months of labor in addition to our five-year structure and one-year parts warranty. Direct Lift excludes labor under their standard warranty offering. Although we'd like to say that both candidates have their strong points, our comparison proves it's a little more than one-sided. Let's face it, the Direct Lift's best selling point is price, and even there the discount is not worth what you're losing. Price is what you pay for a product or service; cost is what you pay over the lifetime of the product. We're proud to say that BendPak is not only the car lift global leader, but the support and service global leader as well. 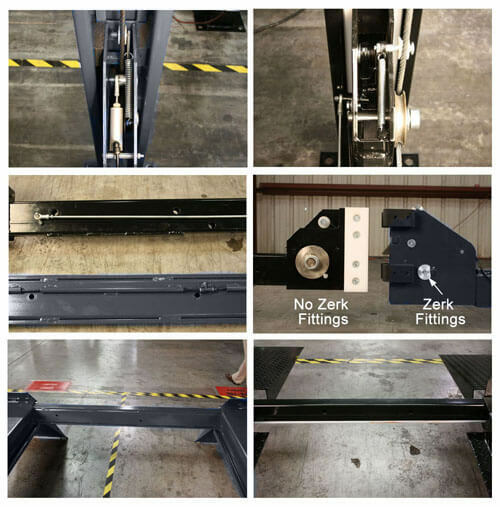 If you plan on getting the most out of your lift, please consider quality, service and support, company history, peace-of-mind, ease of doing business, overall product performance and safety before making your purchase. For an insider's guide to buying a car lift, please have a look at the Top 10 Things You Need To Know Before Buying A lift. At BendPak, we lay all our cards on the table because we know the difference between an informed consumer and an unsatisfied customer is research. Make sure your lift company is on your side.